The 11,916 foot peak of Mt. Charleston looms large, looking over Las Vegas, Nevada. 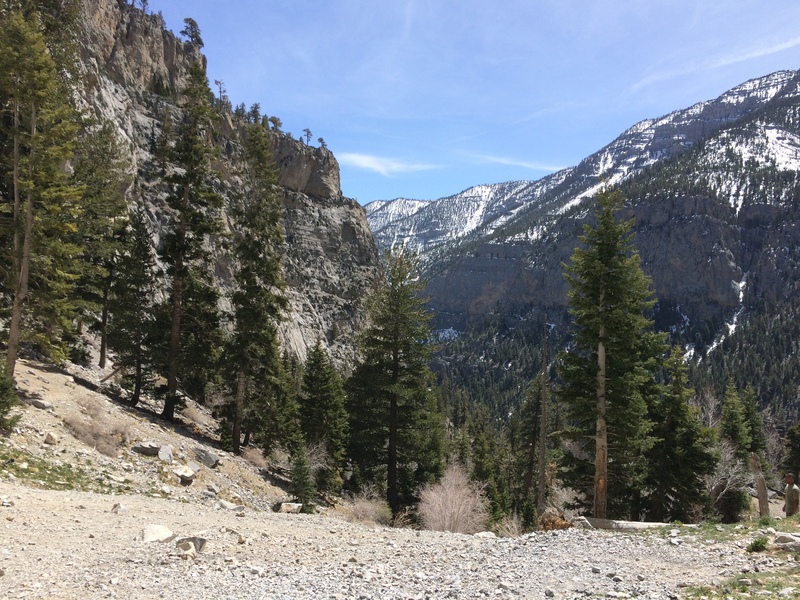 Within a spectacular forty-five minute drive I was at the Mary Jane Falls Trailhead – Elevation 7,800 feet. I wasn’t properly dressed. With blue jeans, hiking boots and a long sleeve shirt I had underestimated how warm it would be on the trail as I began the one and a half mile hike that would ascend another 1,500 feet. The trail is well marked, well maintained and well worn. I marveled at the fact that hundreds of thousands of hikers had helped pave the path before me. The trail was full of hikers ascending and descending. The warm “humid-free” air was breathtaking. 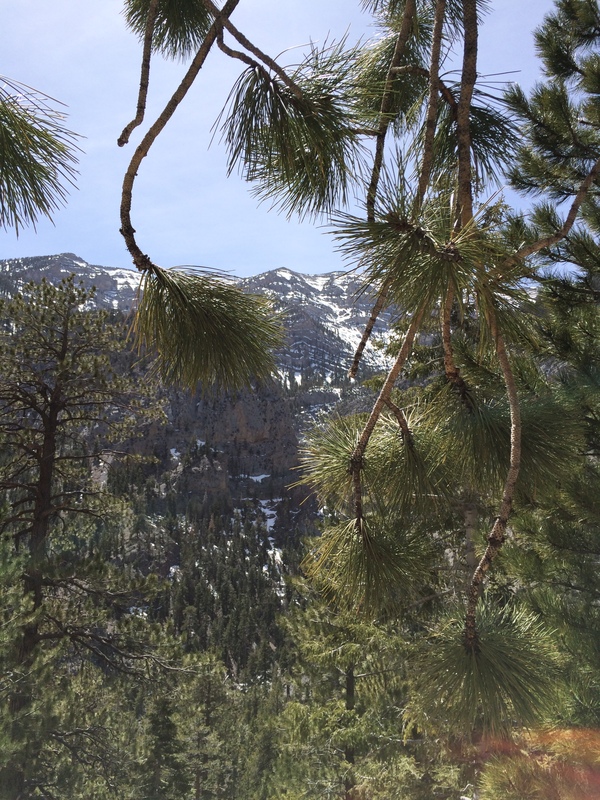 The view of the tall evergreen pines lining the trail was an eye-full. The climb literally took my breath away. An interesting phenomena started happening about half-way up the trail. As I was ascending, there were those on the trail descending. Sure enough, this mantra of “You’re almost there!” encouraged me and motivated me to keep going. The fascinating thing about this particular hike is that I was never able to see Mary Jane Falls until I actually arrived. I just had to trust the trail and adhere to the advice of my fellow hikers that I was almost there. The moment finally arrived where I arrived at the summit of Mary Jane Falls. I am hiking through life and as I ascend the Mountain of God I run across all sorts of hikers ascending and descending. How much further would I be able to travel up “my” mountain before I would hit the summit thus ending my hike? 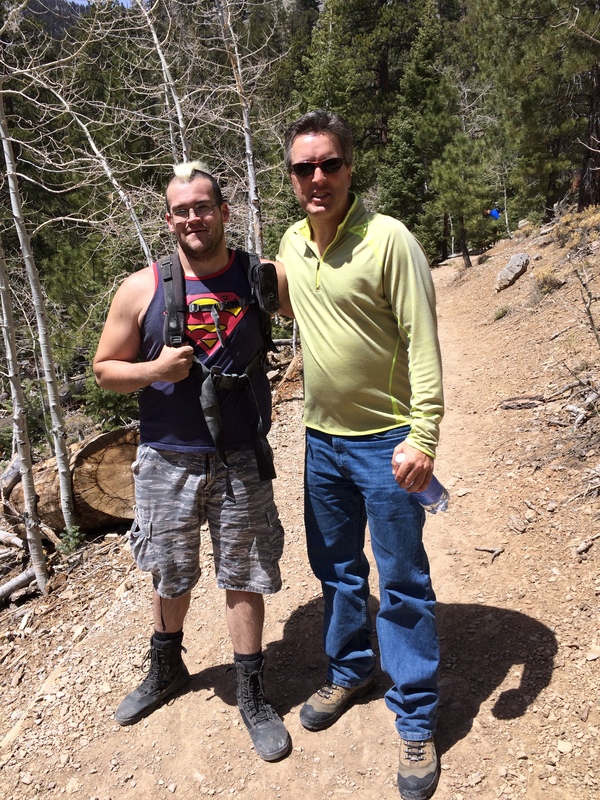 I had just taken a few steps onto the trail when I ran across my friend Hannah Noel. Her mountaintop was only nine weeks high. About ten more minutes along the way Jacob was running down the mountain with the biggest smile on his face, his peak only being seventeen years high. And so this is how it went for a full hour. My grandparents…Nana and Dendy, Momma Jerry and Paw Paw..
My dad…He was still smoking his pipe! How high is the mountain that you are ascending? For some of us the peak will be ninety years high. Whatever the elevation our peaks might be…we just keep hiking! I knew I was close but I couldn’t see it until I came around a bend in the trail! We will hear that victory chant as we walk or run or crawl on to the Summit of God’s heavenly kingdom, exhausted and exhilarated and literally out of breath! As I sat there for about thirty minutes I had the complete joy of joining in the chorus of “You made it!” to my fellow hikers, many of whom I had passed along the trail. Then the time came for me to start my descent. Guess what I had the privilege of saying to each hiker I passed as they were ascending the trail? Nikolai Ivanovich Bukharin was one of the most powerful men on earth. He was a Russian Communist leader during the Bolshevik Revolution in 1917 and afterwards. There is a story told about a journey he took. He went from Moscow to Kiev in 1930 to address a huge crowd. The subject was, or course, atheism. He attacked Christianity! He said some insulting words about Christianity. And he argued against it as well. It took him a long time to convince the crowd. At the end of his talk, he was confident that he had convinced the crowd that they should reject Christ and embrace atheism. At the end of the meeting Nikolai turned it over to the local parish priest to dismiss the crowd. The priest humbly ascended the stage and complimented Nikolai on his eloquence. Don’t you just love that! I have heard this story for years. I have no idea if it is true or not. I guess it really doesn’t matter. 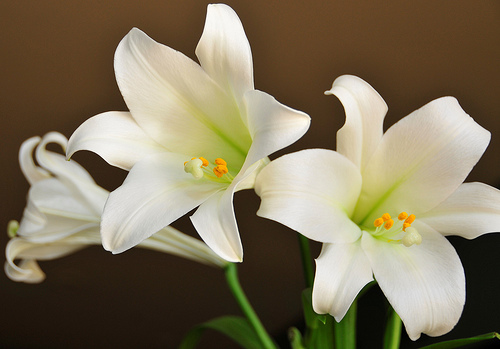 If we didn’t utter these words the Easter Lilies would trumpet the praise of this good news around the world! May the promise, the presence and the power of these three words bring you much joy today as we celebrate the resurrection of Jesus Christ! As Jesus found new life, may all of us find, discover and embrace the new life He has in store for us this day! I have seen it hundreds of times. It’s the most difficult day of days. All the preparation and prayer in the world cannot prepare you. It probably didn’t help you. It didn’t help Mary or Peter or the disciple that Jesus loved – John. They watched Jesus be hailed as the Prince of Peace as he made his triumphal entry into Jerusalem just six days ago on Palm Sunday. They watched him dismantle the money changers in the temple. They ate with him around the table at supper on Thursday night. They all had their feet softly and gently and lovingly washed on Thursday night. They all saw him troubled as he prayed with such heartache in the garden. They all saw him get arrested. And now, Jesus is dead. His tortured, pierced, bloodied body has been laid to rest in a tomb. And now the question that faced his mother, his family, his friends and his disciples faces us.